So the best partner ever for cheesy toast is tomato soup. 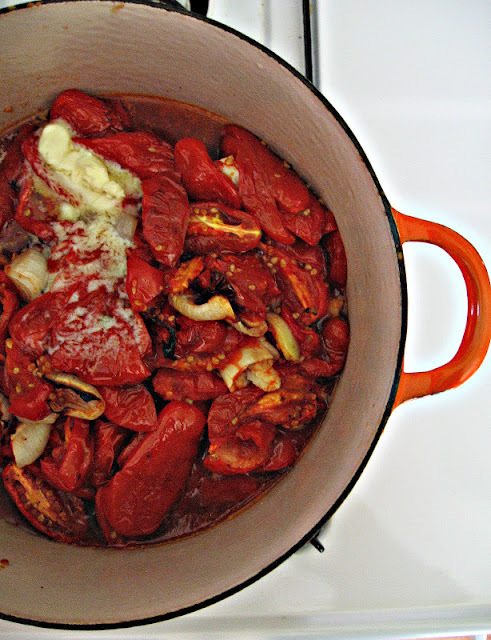 I finally got around to using up my summer bounty of San Marzano tomatoes - hooray! I know you're jealous of my slippers, but they are a crucial part of my winter attire, seeing as I live in a cold house in an even colder province. The temperatures have been sliding and snow is on the ground and all I want is soup in my belly. I put these on a pan, with hunks of garlic and onion, the last of my thyme, coarse salt, pepper and gave it good drizzle with olive oil. They roasted away for 40 minutes or so, and my house smelled glorious. When nice and soft and a little charred, the tomatoes were placed in my favourite bargain of the year (Le Creuset for $10!) and simmered with a bit of butter and broth. Use an immersion blender to puree soup until smooth, then you can strain out the seeds and skins through a fine mesh sieve or just eat as is - it's fibre, right? Finely shred some fresh basil, stir in a little cream and adjust the seasonings. The finishing touch requires a grilled cheese sandwich. You know how to do that, right? Don't worry, I didn't use Cheez Whiz (but I won't judge if you do) instead I opted for a lovely smoked cheddar on sourdough. Slice the sandwich into little cubes and place on top of the steaming bowls of goodness. This soup is uncomplicated comfort fare. It's creamy - bursting with good tomato and garlic flavour and the basil makes it utterly delicious. 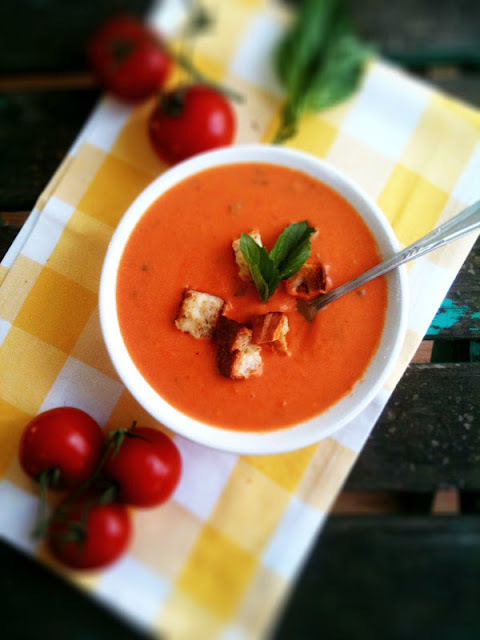 A spoonful of soup and cheesy crouton sometimes makes my day complete. Now that I've told you my dirty little secret - what about you? What is your guilty culinary pleasure? I used San Marzano tomatoes, just because that's what I had on hand. Feel free to substitute Roma tomatoes. The whipping cream is optional; it just adds another layer of lusciousness. Make whatever grilled cheese croutons you like - brie, Havarti, Gouda, the choices are endless. grilled cheese sandwich fixings - your favourite cheese and bread and some butter. One large sandwich is enough for croutons on 2-3 bowls of soup, depending on how many croutons you want. Line 2 bakesheets with parchment. Spread the tomatoes onto the sheets and add onion and garlic to both. Sprinkle with salt, pepper, fresh thyme or rosemary. Drizzle with olive oil and place in preheated 400*F oven. Roast for about 40 minutes, stirring a few times. Slide the tomatoes into your favourite soup pot. Add the butter and stock, bring to a boil, reduce heat and simmer for 15 minutes. Stir in honey. Use an immersion blender or regular blender to puree - be careful, hot liquid! Strain the soup through a fine mesh sieve into another pot to get rid of the skins and seeds, if that bothers you. Add the fresh basil and cream, adjust the salt and pepper, keep soup on low, to warm through. Make your grilled cheese sandwiches, cut into cubes and garnish the soup. Serves 4-6. Confession: I, too, love to eat Cheez whiz in the same way you do!! Almost identical story except for PMS. I am too old!! Cheez whiz lovers unite! When I was a kid, mom would set my sister and I up on a palate (blanket in front of the tv) with cheez whiz and tortilla chips. I haven't had it in forever, but now you've got me craving it! 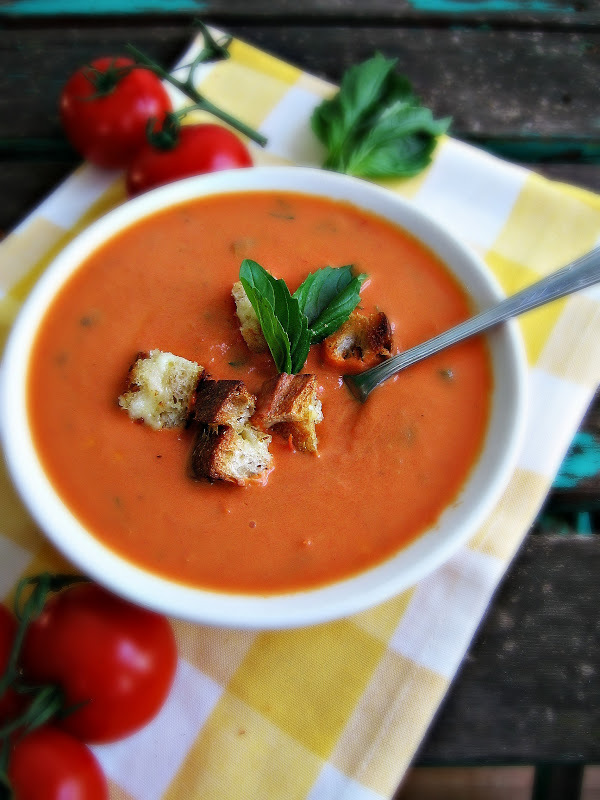 Your tomato soup looks like the perfect thing for these chilly days. I remember my mother making a snack that consisted of small rolls cut in half and spread with Cheez Whiz; they were topped with a mixture of cocktail sauce, shrimp, chopped green onions and green pepper. The rolls were heated in the oven then served warm and we loved them! Can you believe it? I used to love Cheez Whiz on celery back in the day! So I have to say we must have been on the same wavelength with this recipe because just this morning I was thinking .... mmmm homemade tomato soup, how awesome it would be if you roasted the tomatoes with garlic first! And then I open my feed reader and here this recipe was sitting at the ready. I'm a Cheez Whiz virgin- but any sort of cheese on toast is my guilty pleasure. Most often it's a cheat's quick version of a quesadilla- in the freezer there's always tortillas and some shredded mozzarella (shhh). They go in the sandwich press and then it's scoffed. That and a cup of tea fix a hangover and pms, every single time. I am a first time visitor ... lured by the link of the tomato soup (which I absolutely *love* -- your recipe sounds marvelous), and was quite tickled to find out about your Cheez Whiz 'indulgence'. I haven't had any in years (I don't recall the last time I saw in on the grocery shelf -- maybe I skip that aisle?!?) but I, too, loved it. My Grandpa W. always included it as part of our "party" trays, and my Grandma W. would often spread a bit of Cheez Whiz (or butter) on the soda crackers she had with her afternoon tea. As I grew to a young woman of my own tastes and concoctions, my favorite way to eat Cheez Whiz was on white bread with a slice of bologna. I feel like this is a safe place to acknowledge that. Anyone have a clue as to about how many pounds of tomatoes it would take for the 12 cups called for here? This recipe sounds delicious! Hi Clara - I don't have a kitchen scale, so I measured by cups. I'm guessing you'd need about 3 pounds of tomatoes :) Let me know how it turns out! Thank you for responding. I don't know how soon I will make it, but I will try to let you know. I assume that I will be able to reach you on this page? It sure does look good tho, and lately, I am obsessed with soup. It seems like when I think about eating it is the only thing that sounds good. Catching up on Sugarbeans :) Thank you for allowing me to freely say I love the Whiz because I do. Toasted Cheez Whiz & sliced garden tomato sandwiches. Open faced. Lots of pepper. Nothing like it. Your recipes continue to be drool-worthy.